The 110th Anniversary Celebration on Saturday was a resounding success. 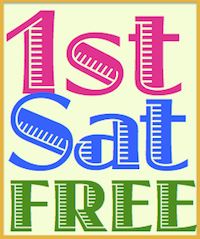 Steve Danko has posted a detailed report on the day at his blog: Maureen Taylor, Photo Detective. I was struck by Maureen's incredible talent and passion for her subject, which we learned is a fusion of her expertise in history, photography and genealogy. I came away with a new appreciation for the value of photographs -- not just as a supplement to our family history but also as a research tool. We all have to become "photo detectives" to make sure we have gleaned all of the clues lying in wait in our own family photographs. All 140 attendees went home with a special souvenir of the day. 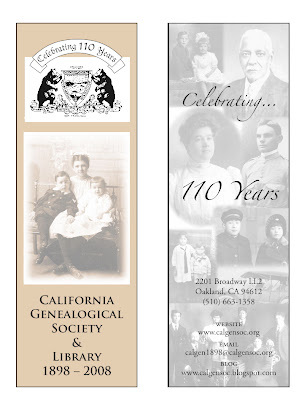 CGS President, Jane Lindsey, planned early on to create a bookmark to commemorate the anniversary but it was CGS News Production Editor, Lois Elling, who thought to merge the idea with the theme. She combined her design skills and love of ancestral photographs to create a keepsake that perfectly complemented Maureen's presentations. Several CGS members submitted photographs for the bookmark. I promised that I would include a personal "thank you" to each and give a bit of background and biographical information about the CGS ancestors featured. I'll start with the two photos that I submitted. 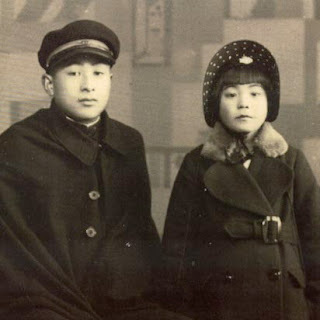 The first is a photograph of my uncle and mother taken in 1938 in Sendai, Japan. My uncle, Iwao OKAMOTO, was graduating from high school and had been instructed by his mother to stop by the local studio to sit for a graduation photograph. He took along one of his younger sisters, Miyako, age 8. My grandmother was surprised to find that all of his portraits included his sibling! Iwao was unconcerned. He told his mother that if she didn't want to include his little sister she could be cut off. I'm so grateful that she wasn't. The second is from my husband's extended NICKLES family. It is of two siblings, Pauline and George Nikolaides, taken about 1928 in the village of Tsintzina, near Sparta, Greece. The brother and sister spent their childhood years in two villages - summers spent in the mountains in Tsintzina, where it is cooler, and the winters in Zoupena; migrating back and forth, up and down the mountain each spring and fall, as has been the custom for hundreds of years. They came to the U.S. with their father and siblings in 1937; their mother remained in Greece throughout her life. Pauline Nickles Poulos died in 1986. George P. Nickles died November 22, 2007. May their memories be eternal. This is one of only three photographs taken on the wedding day of Clare and Alta McAllister THOMSON, parents of Thomas Thomson who is the husband of Shirley Pugh Thomson, CGS board member and recording secretary. The young bride and groom (she only 18, he age 19) were photographed 4 June 1916, in Sullivan County, Indiana. In the back seat are their best friends and witnesses, Paul and Lena Sharpe. The car was the groom’s father’s Buick. Two photographs were contributed by CGS member Lisa B. Lee. 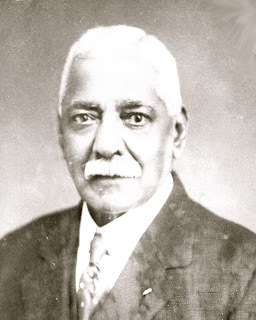 David Moses LEE was born in 1847 in Brantford, Ontario, Canada, the son of William Barnard Lee and Eleanor Jane Smith, and descendant of William Lee, a black Loyalist who fought in the Revolutionary War on behalf of the British Crown. In his early 20s, he moved to Buffalo, New York with his mother and worked first as a blacksmith and then as a male nurse, a position he held for over 50 years. For much of his adult life, he worked in Dr. Pierce's Hospital, an institution on Buffalo's Main Street. Lee died in 1936 in Buffalo at the age of 89. Lisa's second contribution was the photograph of the MILLER Family. William Miller was born in Pennsylvania about 1811 and escaped slavery to Ontario and settled in the Wellington County area around 1835. He and his wife, Mary Ann Clement (a Canadian native) had at least 11 children. 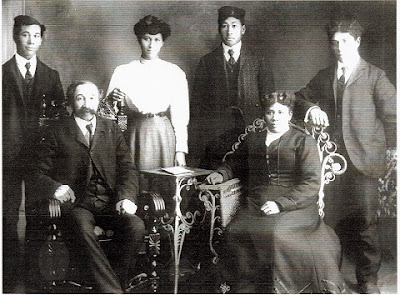 Those pictured in the photo are William Miller's grandson John Sylvester Miller, John's wife, Amanda Cromwell (whose grandfather was a black Loyalist in Nova Scotia) and their children, Joseph, Jane, William and Cecil. I have a few more details to gather for the remaining photographs so stay tuned. I'm a singer/songwriter from Sierra Leone now based in the U.S and I've just released a CD called "The Black Loyalist". The song is about Thomas Peters, a Black Loyalist who was one of the founding fathers of Freetown, Sierra Leone. He led 1,196 blacks on the 15th of January 1792 to create a new nation in Africa. These were the beginnings of the Creole people of Sierra Leone from which I come. In fact I recently found out that a very good friend of mine is a descendant of Thomas Peters. I have been trying to trace my ancestry because one of my ancestors named Thomas Bright was a freed slave who came to Sierra Leone. We are still trying to find out whether he came with the Loyalists in 1792. You can check out my music at www.shabakasounds.com.